Mostar is a tiny town tucked away in the beautiful countryside of Bosnia and Herzegovina, which once was a part of Yugoslavia. Unfortunately, a horrific war followed the collapse of Yugoslavia and the city suffered dearly in the war. As a result, a lot of other important historical building were destroyed too. The iconic Old Bridge which makes this town picture perfect was sadly destroyed in the bombing. Through all misery and horrors. what is admiring is the spirit of life, the boundless energy with which the people of Mostar have rebuilt their home, transforming the town as if it had always been like this. Bus and train station are located conveniently next to each other; the old town is a short walk from there. Bus: There is a regular hourly bus service which connects Mostar to Sarajevo; travel time is 2.5-3 hours. Connections are also available to Dubrovnik (travel time: around 4 hours), Belgrade, Zagreb and Split (around 4 hours). Buses are faster, convenient and offer value for money. Train: It is possible to travel Mostar by rail though the connection is not as frequent as buses. From Sarajevo there are two train daily. On the upside the journey takes you through some of the most beautiful countryside of Bosnia and Herzegovina, and is also cheaper than the buses. 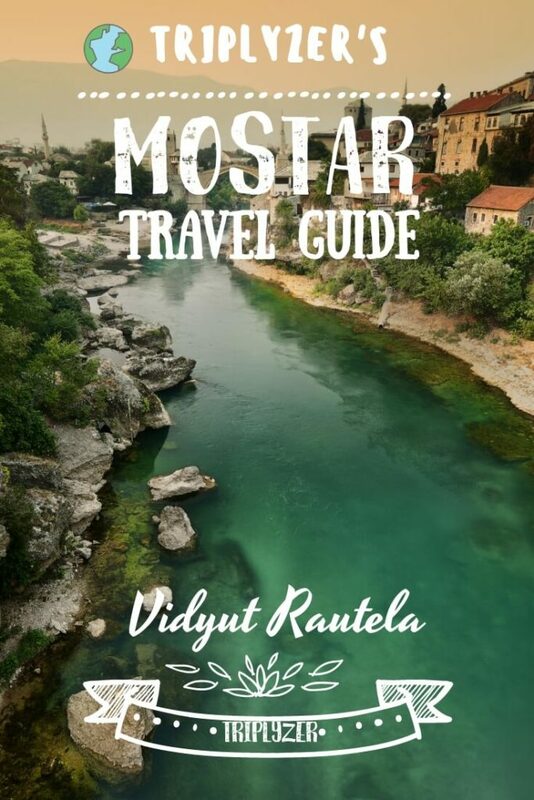 Built on Neretva river in 1566 by ruling Turkish empire, Stari Most is a fine example of Ottoman architecture. The bridge is situated right in the middle and connects the two parts of the city. The bridge, now a UNESCO world heritage site, suffered heavy damages as a consequence of the bombing in the year 1993. Much later in 2004 the reconstruction work finished with effort made to restore it to its original glory. Apart from the architecture and the nice walk it is interesting to see the locals dive from the bridge. These brave men belong to the Mostar diving club. It is customary to offer them a small tip before their daring act. Be warned, do not try to attempt it as the water in the river is quite cold and the sudden change in body temperature may result in fatality. These divers experienced and are well trained to undertake the risky jump from Stari Most. Tip: If you are interested in the History of the bridge – when it was original built to its reconstruction – walk into the Museum located near the bridge. A small fee is required at entrance. The beautiful Kravice waterfalls on river Trebižat are only a short drive away (about an hour) from Mostar. You can take a swim in the pool if you can brave the cold water. Alternatively, go behind the waterfall for a nice view. And if you are feeling hungry, there is a Restaurant nearby with a decent menu. There is no public bus and the taxi would cost around €35-40. If you are traveling solo, ask around to find someone in your hostel/ hotel to split the fare. The admission to the falls is 2 euros and if you park your car outside the parking complex, you will save the parking fee. Take a day trip to picturesque Blagaj tekija which is a site to a Dervish monastery located in the mouth of a cave and by the side of Buna river. In-fact this spring comes out of the cave where river Buna originates. The monastery was constructed way back in 16th century. There are a few restaurants nearby, go for excellent views and try fresh trout. The tranquil sound of gushing water adds to the beautiful ambience. Strictly avoid if it is pouring as the river gets swollen and monastery is submerged in water. Tip: Blagaj tekija is half an hour drive from Mostar. Reach early in the morning as it gets crowded later on. Kujundziluk is a typical old bazaar with middle eastern charm that has a long line of small shops selling everything from handicraft to cloths, fresh fruits to meat produce. It’s a good place to buy souvenirs with reasonable rates which are open to negotiation; euro is accepted widely apart from the local currency. Sellers are surprisingly polite and you can simply browse without being pushed to buy. The name Kujundziluk refers to Goldsmiths, which you’d certainly find plenty of in the old bazaar. One item of particular interest might be lavender. Also, check for copperware made locally here. If you are tired of walking around, there are numerous small cafes where you can relax and have a cup of Bosnian coffee. Krive Most looks quite like a replica of the Old bridge but only smaller, but in-fact it the other way around – Mostar’s Old Bridge is a replica of Crooked bridge. Older than the Old bridge, Krive Most was constructed as a model for Old bridge to replicate. There is not much to do here apart from a quick photo stop. There is an information plaque nearby (in English) to read about the history of the bridge. There is also a pub nearby – The Black Dog – where you can sit in the patio, grab a beer soak in the views of the bridge. Alternatively, you can also dine in the restaurant nearby. Located near the Old Bridge is the beautiful 17th century mosque known as Koskin-Mehmed Pasha’s Mosque. As with other buildings, the mosque too suffered severe damage in the war and was later rebuilt. This beautiful Ottoman style mosque (still in use) is one of the most photographed attraction after the Old bridge. Worth checking out are the elaborately decorated interiors; the wide open courtyard is equally impressive. In the same mosque complex you will also a fountain and a religious school. For panoramic view of the city climb the mosque’s minaret. Though, the climb requires one to hike up the narrow winding steps, definitely not recommended for claustrophobics. Once at the top, the views of the bridge and the river are very rewarding. Admission fee – €5 per person for a combined entry to mosque and minaret. Ouch! Bosnia and Herzegovina is quite an offbeat travel destination in my opinion. I have never heard anyone tell me that they had been here, so your post was like an introduction to this place for me. Considering this place has seen horrific wars, and quite recently that too, I would have expected it to bear signs of that in its architecture and daily life. But reading this, I believe it has recovered quite strongly. Enjoyed reading this. Have a great day! Keep coming and keep discovering! Absolut Animesh, credit to the people for rebuilding their heritage. We, Indians, should take great care of ours too. Hit the subscribe button and get regular updates!